Ludmilla Petrushevskaya was born in Moscow in 1938. The Girl from the Metropol Hotel is a short memoir of the time after her twenty-seven-year-old mother finished university and returned to her grandparents' house after four years away to bring Ludmilla back to Moscow. Ludmilla was on the streets by then, having ‘escaped’ the poverty of her grandparents’ upbringing in Kuybyshev. On the street in Kuybyshev, Petrushevskaya took cold-eyed account of what she could sell to earn enough money to eat. She sang, and recited poetry. After one particularly moving rendition of one of Gogol’s short stories, a weeping woman in a large empty apartment offered her a green cardigan, which she took, a little perplexed, and not especially grateful. She wore it every day. Petrushevskaya is said by some to be one of Russia’s greatest living writers. I had never heard of her. I always have some confusion in my own head about a repressive regime and the awards it grants: do the things a regime praises have the same currency out of country? In this case, I believe so, as she has been living outside of Russia for decades. It is said that in Russia Petrushevskaya was blacklisted in the 70s, was published in the 80s, and awarded in the 90s. I think the citizenry must make their decision, and whomever is read and praised among the citizenry is a good choice for longevity of reputation, particularly in Russia. Russians have a brilliant literary tradition, including important satiric writers who were long-suppressed. Russians know all about the importance of language and how it can move one. 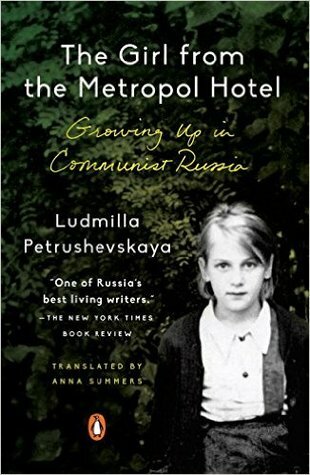 The same way Petrushevskaya looked upon her chances as a child on the streets is the kind of voice she uses in this memoir. She is matter-of-fact and does not at all curry our sympathies for a cold and hungry childhood. Everyone she knew was the same. There was no feeling sorry, just being more clever, more lucky, more resilient. To live by one’s wits requires keen attention, which must be how her writer’s eye developed. Whatever had value in a certain scene is something worth remembering. Petrushevskaya is also known as a playwright, and there is a bit of a playwright’s multiplicity of voice in her memoir as well. She is able to see points of view and where they diverge, defining conflict. She has been writing from Eastern Europe and America since the 1990’s, though she recently began composing new lyrics for songs she likes and is singing on a cabaret circuit, that sometimes includes major venues like Moscow House of Music, around Russia. Three books of stories have received wide acclaim, and The New Yorker published three. Her stories are said to be known for a fairytale quality, urban legend, or perhaps dark reports from a mystical, allegorical fantasy world. The books titles might give readers some idea of her grim realism: There Once Lived a Girl Who Seduced Her Sister’s Husband, and He Killed Himself: Love Stories, and There Once Lived a Woman Who Tried to Kill Her Neighbor’s Baby , and her latest to be translated, There Once Lived a Mother Who Loved Her Children, Until They Moved Back In. Moments of real pathos in this memoir are written (and spoken in the audio version) with no pathos. Like anyone who has experienced the trauma of revolution or war, if one manages to survive, one often just gets on with it—with the business of living. Not another second will be spent wasted by looking back and stemming one’s forward progress with regret. The audio was narrated by Kate Mulgrew, produced by Penguin Random House. Anna Summers did the translation and has written an Introduction which gives readers some background, in case, like me, you’d never heard of Petrushevskaya.